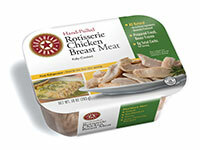 Lightly marinated whole chicken breast slowly rotisserie-cooked, just like at a gourmet deli. To ensure a tender and juicy bite, we hand-shred the roasted meat while it’s still warm, chill it, then package it immediately to lock in maximum moisture and flavor. 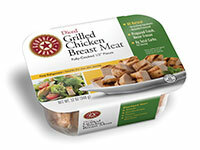 INGREDIENTS: Chicken Breast Meat, Water, Chicken Broth, Sea Salt. We lightly marinate our fresh chicken breast in sea salt and water only, then flame-grill, dice and package it immediately to maintain its moisture and tenderness. These flavorful pieces are an all-natural, nutritious alternative to cold cuts for sandwiches and salads. 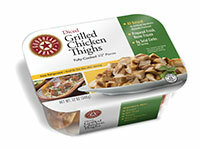 We lightly marinate and grill our chicken thighs, then dice and package them immediately to retain their juiciness. These succulent yet mild flavored bites are perfect for Asian stir-fry and noodle bowls or Latin American favorites such as tacos. INGREDIENTS: Chicken Thigh Meat, Water, Sea Salt. 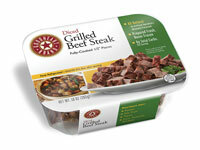 We trim beef steaks from USDA-choice beef and marinate them lightly. We then flame-grill them medium-rare, dice and package them immediately to seal in freshness and flavor. They’re equally delicious served chilled in a salad or warm in stews, tacos and more. INGREDIENTS: Beef, Water, Sea Salt, Natural Flavors.